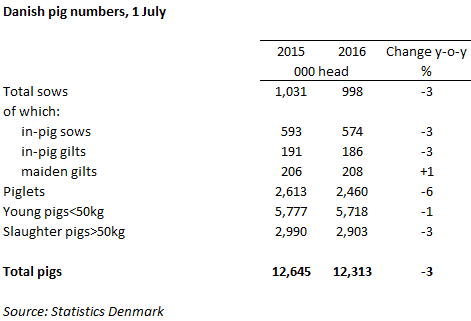 DENMARK - Provisional figures from the 1 July pig census showed that the number of pigs fell at the start of Q3 2016 versus the same period a year earlier, by 3 per cent, to 12.3 million head. This continues the year-on-year decline that has been recorded in the pig herd each quarter in 2016. The breeding herd was also back by 3 per cent on 2015 levels, and for the first time this century, total sow numbers fell below 1 million. Both in-pig sows and in-pig gilts were down 3 per cent, while maiden gilts recorded a modest rise of 1 per cent. All of this is indicative of a continuing tightening of supplies in the second half of the year. The number of young pigs fell modestly by 1 per cent, while slaughter pig volumes were back slightly more at 3 per cent. Therefore, it may be expected that production volumes will fall both in the shorter and longer term. Throughout the second quarter of 2016, the Danish pig reference price has surged over €19/100kg, and currently stands at €150.01/100kg for week ending 31 July. The tightening of supplies, coupled with strong export demand from China, has contributed to this, although price growth has started to slow in recent weeks.